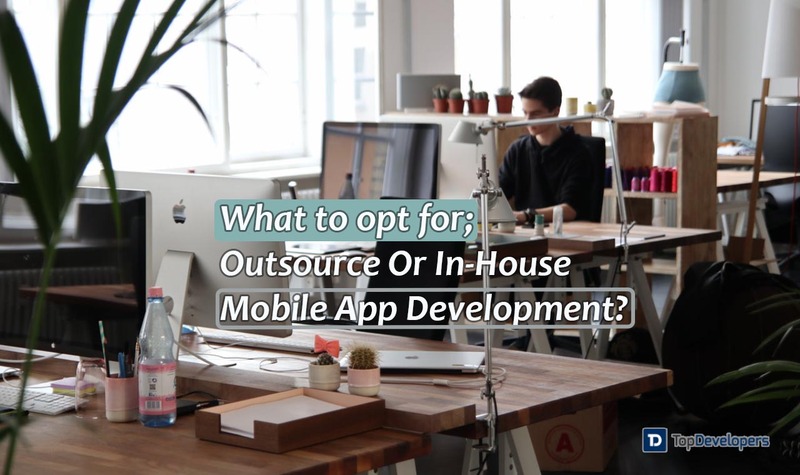 Here are some factors that can help you to choose an in-house mobile app development team or outsource to app development company for your next big project or business. At the rapid pace, the world is becoming mobile-attuned. The mobile app development has now added a competitive cornerstone for most of the businesses to grow by leaps and bounds. Many times, the businesses time and again stuck with a question- Should we hire an app development agency or build up the team to engineer the app internally? Certainly, there is no straightforward answer to this. It demands a careful consideration of a few things and specific circumstances. The decision is a crucial part of the pie as the right approach enable the businesses to stay synced with their goals while wearing mobile golden boots. After much research, it’s found out that zero in the choice to one is not a piece of cake. Both the development approaches are packed with their own pros and cons. Undeniably, the app developers in USA have a good understanding of the mobile space and development tidbits as they may have built apps for diverse industry verticals when compared to the in-house team in the country. The in-house team at first comprehend the app requirements, map it with the business goals and priorities and leverage the existing industry experience and the latest trends to build the app which creates a buzz on the floor. Also, the in-house team opts for a developer of mixed backgrounds so as to act an add-on and fulfill the gap wherever required. Verdict: Outsourcing the project wins in this perspective. Every mobile app development company has a team of developers, designers, testers and quality assurance engineer, project managers and accountant who have worked collaboratively on multiple projects, and pretty aware of each other’s strengths and weakness. On the other hand, jumping on an in-house development train means hiring a completely new team for the app developers who have never worked together before. It’s panic to bring the whole team on the same page and make them work with team spirit. This could be a nightmare if working on some strict deadlines. Verdict: Outsourcing the project is a clear winner. None other than the internal team will have a better understanding of the organization vision, goal, competitors, target audience, organization theme and brand voice. The outsourcing agencies cannot gain this knowledge and insights which are deeply ingrained in the organization DNA. Also, an attempt to transfer the knowledge to the agency can be made, but that’s not a matter of a single call. It’s a tedious process which demands a lot of time and effort investment. At the end, summing up all the factors, it unnecessarily stretches the development time and impacts the end product. Verdict: In-house app development triumph over outsourcing development here. Communication, project review and approvals always suffer when there are differences in time zone or nations, which in turn impact the work productivity. Additionally, the scheduled time to exchange the reviews is a long process and the development team cannot reflect the changes in the app off the bat. On one hand, the team at the same physical location can anytime discuss the project and take the decisions, even at the lunch breaks, which enables faster approval and needless delays can be avoided. The availability of the plethora of communication channels and productivity tools helps businesses to stay synced and connected with the development team, which makes it easier to work in collaboration despite having geographical differences. Also, with schedules in place, the process-driven approvals are feasible. Verdict: It’s a draw on this one. The advantage of recruiting in-house team lies in the end number of revisions and no budget constraint. At the same time, it becomes disadvantageous in the sense that the team keeps spending hours in making tweaks as experimentation and consequently, the app won’t get developed before the deadline. Also, the payroll based in-house team is not so concerned about the same unless they are getting their salary on time. When the project is outsourced, every feature to include, number of revisions, feedback rounds and modifications are mentioned in the document along with the budget which abides by both the parties. The organizations are clear to the point that any major change takes the development out of the scope and increases the already set budget. As opposed to flexibility with an internal team, the accurate estimate along with fixed scope involved in outsourcing is beneficial because of worse financial consequences it will still be better. Verdict: On a clearer note – Outsourcing the project overseas is the best approach to consider. The research had proven that organizations in the USA struggle to fill the mobile developer vacancies and hiring the talent costs between $4000 to $5000. In addition to talent hiring, the skilled developer is expected to shell out the salary in between five to six figures. Also, the varying taxes, health insurance, office space, software needs and hardware requirements incur additional cost. When the assembling the development team cost, salary and overhead costs get summed up, the amount becomes too high which is difficult for any startup to afford. On the contrary, when the app development agency is employed, the development cost varies widely and depends upon several factors such as the project scope, app complexity, backend needs, development methodology followed, team size, experience, and location. The significant difference in the cost can be observed from one outsourcing team to another. For instance, in India, the hourly rate of app developers is as low as $10 per hour, while in the USA, it’s not going to be less than $60 per hour. Verdict: It’s neutral. It depends on the app needs, preferences and budget the organization has. In addition to cost-saving advantage delivered by outsourcing approach, it also accelerates the time-to-market the app. The seasoned pros in the IT company are well-versed in technical experiments, up-to-date with latest technology trends and ready to accept the challenge without making any compromises with the app quality and timeline. Moreover, the company comes to the question when the project won’t get finished by the deadline. This is not the event with the in-house team, they keep on making modifications and busy in experimentations without much concerned about the turnaround time. This is why the apps engineered by the in-house team generally take months to years to roll out on the floor, which is at all intolerable in today’s fast-paced mobile world. Verdict: Which works like a pro- without any doubt, outsourcing the project excels. On the flipside, with the in-house route, it’s incredibly easier to own the rights over the source code without having any risk as the code ownership won’t come into the question. Besides, the crucial information about the organization and its customers also stay within the office walls. With outsourcing partner, it’s the biggest downside because the close integration with the business process puts the data about business nitty-gritty squarely in the hands of third-party developers. It can be avoided by signing the NDA with the team backed by legal measures which ensure that the rights to source code will be given to the organization during the final app delivery and all the information related to the app is kept confidential. If the breach of agreement happens, then a legal course of action can be taken against the development company. Verdict: What’s the right route to go- it’s a draw between the two. Mobile-first business is the impetus behind the tremendous growth in the mobile app development. Increasingly, the businesses are adopting the trend to make the business ready for the future, but building the app from the scratch is not a work of an average Joe. A lot of things need to be carefully considered wherein opting for outsourcing the project or building it in-house is a critical question. The list of arguments for both types of development approaches helps you make the right decision so that your investment won’t go into the vain. Chalk out your goals, identify the gaps and match with the development approach that meets your business unique needs to get the optimum results.